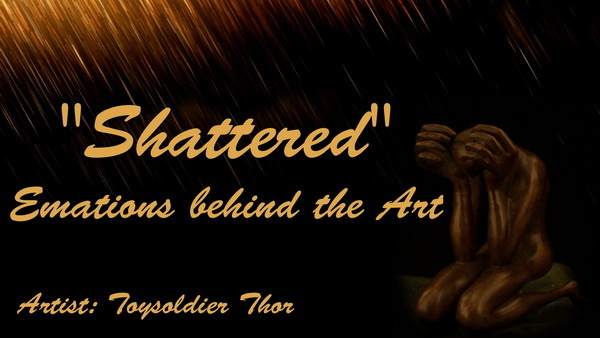 On February 28th, 2016, Toysoldier Thor received his greatest honour to date as an Artist who started his journey exploring the creation of fine arts in SecondLife back in April 2010. On this day, Toy was awarded the 2016 SecondLife Avi Choice Award for Favorite Artist ! Considering the enormous pool of fine arts creative talents in SecondLife and that this award is the broadest of the 53 Avi Choice Music, Arts, Dance categories (covering almost all fine art genres), even being nominated is an honour. Toy has been honoured to be nominated for this award for the past four years. But, to win the award in 2016 is truly a humbling and meaningful milestone in Toy's life. He would NEVER have imagined winning an award such as this when he started back in 2010. Toy thanks all of you that nominated and voted for him. Truly an honour! As a tribute to this award, Toy is working on an exciting opportunity regarding his Real Life artworks (both his canvas prints and bronze statues) that is intended to honour all those in SL that have supported his journey as an Artist and shown appreciation for his art. Smiles.... Please Stay Tuned for this announcement. "Emotions behind the Art" video series. But as you started reading this blog, you might be asking yourself: What the heck does Toy mean by MetaART? Toy's recent video "Shattered - Emotions behind the Art" is the latest example of his MetaART. But this blog post will explain what MetaART is to Toy and how he has followed the path of creating it. In order for Toy to explain his definition of MetaART, it helps if Toy explains his personal definition of "ART", which is likely a similar belief as what most others understand it to be. HOW DOES TOY DESCRIBE ART ? We can go back to the earliest times of human evolution where we find an abundance of evidence of what we would refer to as art (i.e. Cave Art as a perfect example). Why did these simple minded human species make any effort at all to come up with methods to create these graphics on the walls to draw rudimentary animals and celestial bodies and other known items? Because they felt it was important for an individual to convey an experience he/she had that others were not able to share. How important would it have been to convey to others back in a tribe that there was a large herd of animals... big animals that looked like mammoths? How many... where they were... and even how they could be killed for food? They discovered they could do this by reflecting their personal experience in the form of drawing it out on walls to match was was captured in their minds. Although there is no evidence from back then to prove this, these ancient people likely also conveyed their experience by drawing in the sand and by moving their bodies in "dance" or making similar reflective sounds like "music" to get their message across. But basically, each of these ancient individuals was REFLECTING REALITY AS WAS CAPTURED IN HIS/HER MIND by means of generating a human created interpretative artifact. The individual was an ARTIST and the creation was and still is referred to as ART. Its not a coincidence that the word ARTIFACT begins with the word ART. As humans evolved, it was no surprise that human ingenuity evolved and extended this rudimentary utilitarian purpose and respective skill-sets of creating "ART" to explore less tangible experiences in the minds of these "ARTISTS". As we observe the countless forms of art throughout the ages all the way to modern times, we can see that ART was no longer just the reflection of actual experienced reality (i.e. like landcapes or war scenes or a moment in time). ART was also reflecting an Artist's interpretation of a feeling, a belief, and emotion, a philosophy that was not as tangible a reality and could only be conveyed to others in much more symbolic creative forms. This ART is often the least accurate to convey to others - especially if others have not shared the same ideas as the Artist or do not grasp the more symbolic reflections created by the Artist. In Toy's mind as well as countless others that love art, this form of expressionist / symbolic art is the most enjoyable and stimulating for both the Artist - challenged to find ways to effectively convey this intangible message - and the Art Lover that tries to interpret the Artist's message he / she placed in the Art. Toy's art has evolved to create these more symbolic emotionally expressive artworks. As such, he is always striving to find ways to both articulate as well as more powerfully and effectively express the emotions & thoughts he wishes to convey in his art. The primary and most obvious method is to create that initial artwork that tries to convey his message. Toy has created several artworks that do this and released for all to try to interpret. BUT... What if an Artist wanted to push the message / emotion / concept behind an initial artwork further? Enter Toy's definition of MetaART! If an Artist wishes to convey one of his/her initial artworks from a different artistic angle, or use another art medium that can express the initial artworks message more effectively or with more power then this is what Toy would define as MetaART. A critical component that separates MetaArt from another new form of art is that MetaArt would be ART that uses the initial art as a base. MetaART is Art Describing Art. 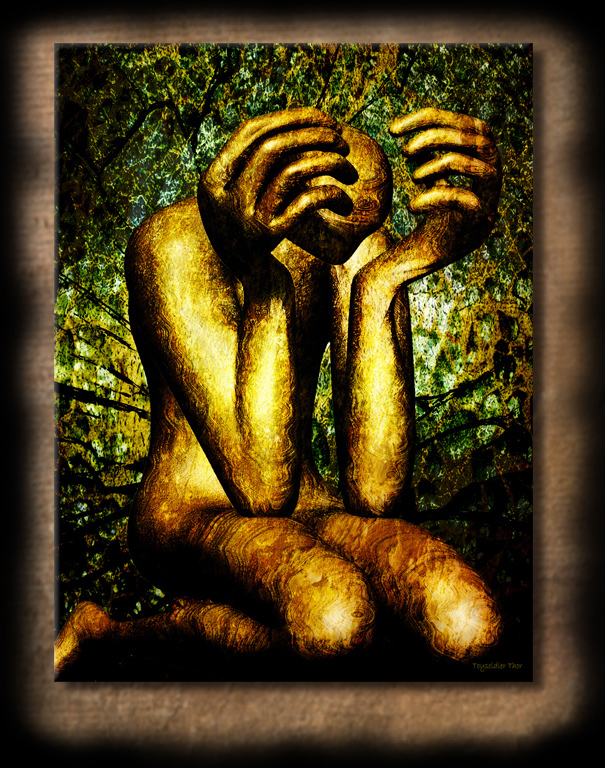 Often Artists will create a single artwork to convey what is a powerful emotional message but feel that a lot was left on the "Creation Floor" - the ability to provide different views of the same message. Like a photographer that takes several photos of a subject and a few of the photos are equally as powerful in their own way. Which to use if you only want one powerful message to go forward? Or a Painter using differing colors or strokes. 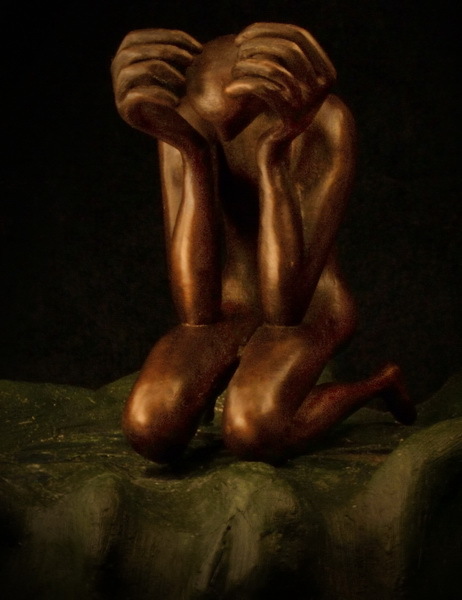 Or a sculpture position a hand or body in differing ways. Once the decision was made, the other options are often left on the cutting room floor that no one sees. With MetaART, the Artist bring new interpretive life to the emotions behind the initial artwork. In the past couple years, Toy has often created many forms of MetaART on his own as well as worked with others to create MetaART projects. And in fact Toy finds the creation of MetaART to be very exciting and fulfilling as it allows him to explore different art mediums to convey what was an important message in the original artwork. The latest MetaART creation was with Toy's SHATTERED 3D Mesh Art Sculpture. Shattered has had the most number of MetaART creations of all his artworks. For Toy it is the artwork he is using to establish a pattern of the various MetaART avenues he could use for his other artworks in the future. With Shattered, Toy initially created his 3D Virtual World Mesh sculpture. But as is common practice for Toy, he immediately created a 2D wall artwork of the Shattered sculpture which were both released together in 2012. He then created a Real Life 2D canvas medium of Shattered. Then in 2015 he created a Real Life solid Bronze statue of Shattered. Finally, in November 2015 he released his first "Emotions Behind The Art" video using Shattered as his first subject. Finally, Toy's most successful and satisfying MetaART project happened in the spring of 2014. It could actually be referred to as Toy's MEGA MetaART PROJECT. The project was called "ART BEGATS ART" and it was the co-brainchild ideas between Toy and the founder of the amazing Elysium SecondLife® Artistic Stage Dance Troop - BabyPea VonPhoenix. That spring Toy was asked by Rose - the Founder & Fashion Designer of the famous Paris Metro Couture in SecondLife® - to exhibit in her popular Paris Metro Art Gallery (PMAG). Toy gladly accepted. A highlight for every PMAG exhibit is the Exhibit Opening event whereby Rose actually creates a special "Artist's Series" dress fashion using one of the Artist's actual wallart artworks. Then typically a live musician is hired for the event and the fashion is given away during the event. Toy wanted something special for his Exhibit Opening Event. While talking to BabyPea prior to the exhibit, they both came up with the idea of trying to create an Elysium Artistic Dance show whereby each of the troop dancers selects any one of Toy's artworks from his gallery and creates an interpretive dance for the artwork. Basically, it was was the blending of fine-art, dance, music, and stage to create a powerful live MetaART for several of Toy's artworks. The dance show would then be actually performed on the PMAG open area for all to experience Dance Art, Music Art, Stage Setting Art, and Fashion Art all interpreting the Fine-Art that Toy was exhibiting at the gallery! It was an overwhelming success! Toy even created a video of the event first performed at the Elysium Theater. Toy's recent "EMOTIONS BEHIND THE ART" Video series is just the latest MetaART porject - one that he hopes to expand upon by producing new videos in the series. He will also be looking for new MetaART avenues to explore in his quest to more powerfully express the emotions behind his art. This month I was honored to be selected as the Featured Artist in the December 2015 issue of Windlight Magazine. Not only was it special to have been interview for the article that included several photos of my artwork, my one of my artworks was used as the cover artwork. Following is the link to the Windlight issue. The article about me starts on page 30. The new magazine that is now only on its 5th edition is incredibly produce and published with a large volume of stories and gorgeous photos. I recommend looking through the entire issue. Toy's Art Exhibit @ The Living Room Gallery Open! to exhibit a sampling of my artworks for the month of June 2015. The exhibit kicked off yesterday June 2nd with a 7pm slt Opening Show that proved to be a big success! A common practice for most exhibits is for the Artist and/or Curator to develop a theme for the exhibit. For the Living Room Gallery, Daallee & Owl provide the incoming Artist with a tall, round room, glass walled and domed blank floor space. They leave it up to the Artist to develop the space and artwork displays to meet a theme he/she creates. When I first landed at the space 4 days before the exhibit's opening event, I really was lost on what to do with the space. 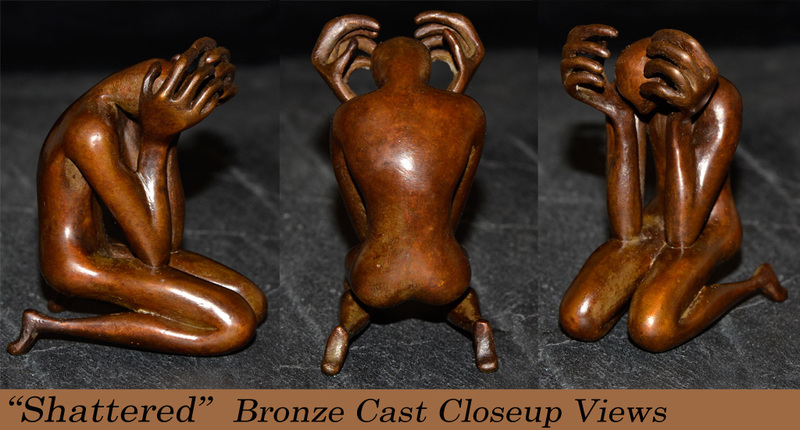 I did know that I wanted to highlight my recent accomplishment of completing my first transformation of one of my SL Mesh Art sculptures (Shattered) into a real life bronze cast. The problem was that I had not created ANY related posters, photos, displays, etc related to this theme. But after a couple hours of playing around with some floor / wall prim placements, my idea of an exhibit floor space layout started coming together. I transformed the 1 floor exhibit into 2 floors. This gave me a lot more exhibit space and effectively leveraged the nice glass dome. I also extended the main floor past the glass perimeter walls with a new solid wall. I used the space between the glass and solid walls to place all of my Mesh Art sculptures which actually gave the statues a heightened sense of importance by being behind glass. I built a small musician stage on the main level. 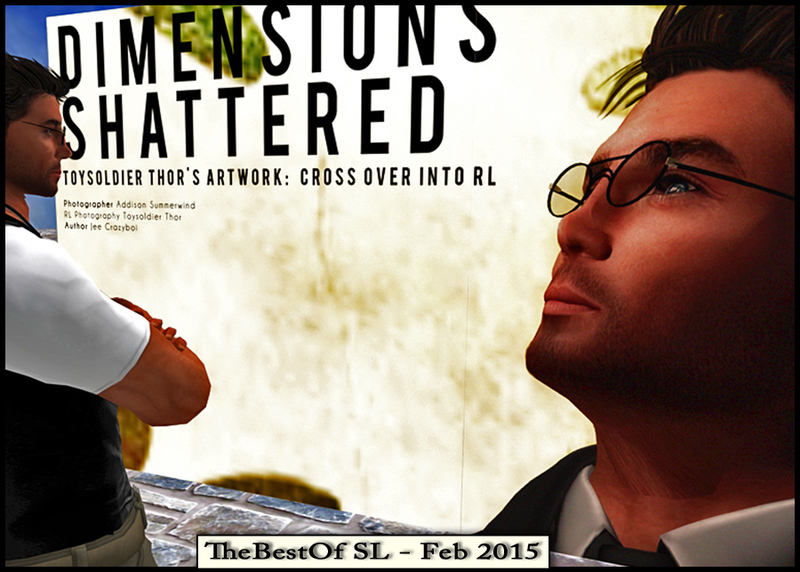 I then used the main back wall of the 2nd floor to exhibit my SHATTERED SL MESH ART to RL BRONZE JOURNEY theme. The entire exhibit was populated with a wide variety of my eclectic art themes, styles, and mediums. Although the space was relatively small, the layout provided ample space for even the largest turnout. I completed the entire gallery layout and artwork display in two days. 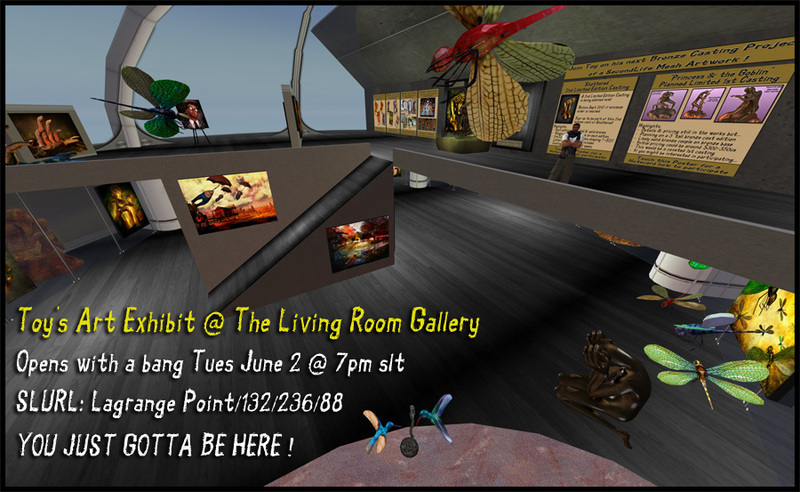 At the same time, Owl, Daallee and myself worked hard to get the message out to the Secondlife community that the opening was happening June 2 @ 7pm slt. I need to thank both the ladies for all their efforts in getting the message out. And from the amazing consistent large turnout of art lovers and friends throughout the entire 1+ hour event, the efforts were well rewarded. Also, the event was completed with some beautiful music styling from Joe Paravane. Here are some photos I captured from the well attended event. As you can see from the photos of the event, the crowd was amazing and I must also say so elegantly dressed. It was almost as much a fashion show than an art show - LOVE IT :). I want to personally thank each and everyone that attended the event - even if some only showed up for a short time. In addition to attending, all the super kind compliments on my artworks DID NOT GO UNNOTICED! I am humbled by all the kind compliments! I was also honored to have the popular Simon Linden show up and stay for the entire show! Simon has really become the LINDEN FACE on the grid and we residents truly appreciate his appearance. I means a lot to all of us. I want to add another special thanks and hugs to everyone that came and actually purchased some of my artworks on display and taking the time to talk to me about it. It means so much to me that someone would like my art enough to actually spend their hard earned Lindens on one or more of my artworks. Finally I must thank both Daallee and Owl for inviting me to their gallery space, promoting the event, arranging the entertainment, and even hosting the event. THE BUGGEST HUGS TO BOTH OF YOU ... and Nora as well for assisting in hosting. For those that missed the event - don't fear. My art is on display for the entire month of June. Also, the exhibit ends with a CLOSING SHOW June 23rd at 7pm slt. Facebook Restores Toy's SecondLife Name - How Was It Done? My SecondLife community of friends have asked me to tell me more about how I was able to successfully appeal Facebook's long-standing strict policy on "REAL NAMES ONLY" which has wiped out many 1000's of SecondLife named FB accounts over the years. This blog provides a background of my experience through this process, my thoughts as to why Facebook surprised everyone in our community and restored my SecondLife name, and some guidelines for other SecondLife resident considering if they should an appeal and how to appeal. 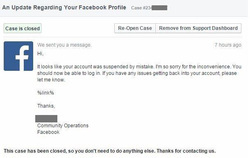 On June 1st 2014, after being very active for almost five years on Facebook (FB) under my account Toysoldier Thor (aka Toy), FB deleted my Toy account among 100's of others. This is a very frustrating action FB frequently executes against SecondLife® (SL) avatar named FB accounts as a policing action to enforce their outdated "Real Names Only" TOS policy. At that time I wrote a blog about this very disruptive frustrating practice, how it impacted me, and how FB needs to get with the times. As a result of my FB account deletion I created an account at AvatarSocialNetwork.com. I also created a new replacement FB account named SCOTT to use that FB found to be acceptable. Sadly, having the SCOTT FB name was very limiting and frustrating for me as it is for many other SL residents who lost their SL avatar named FB accounts in these dreaded FB sweeps. Why? None of my SL friends knew this Scott name so they could not easily find me. Also, Scott had no relevance to the branding / identity of Toysoldier Thor - a name that ties to all I try to promote in my sphere of the virtual world community. 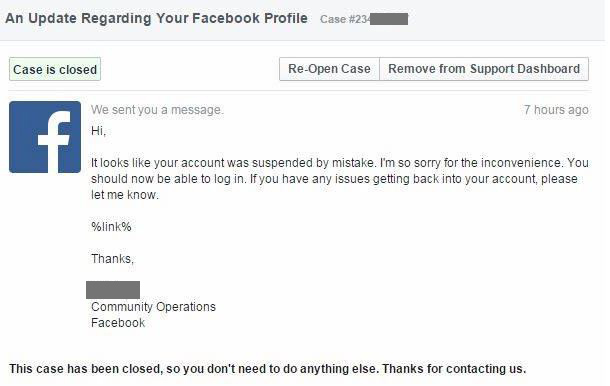 Therefore, on two occasions during the past year I filed support tickets with FB community support to appeal their decision of deleting my Toy FB named account. In both cases I was 100% stonewalled - being quoted with canned FB policy statements and clearly not even reading details of my appeal on why my account should be restored. On February 19th 2015, I was pointed a New World Notes blog about how Sister Roma - a famed and admired San Francisco Drag Queen who was pressuring FB to improve their rigid "real names only" policy was also willing to help SL residents to get their avatar named FB accounts back. I contacted her and provided her all my appeal details that I had unsuccessfully tried to show FB staff during my previous appeals. She was very supportive and saw how my case was yet another clear example of how FB's TOS was out of touch with the needs of its customers. She promised to forward my appeal through her channel into FB as a new case but made not promises it would succeed. Over a month went by with no news from FB. Even Sister Roma and Wagner Au of NWN Blogs were very skeptical that I would win my appeal. Especially in light of a recent communication from FB that further clarified and made it extremely clear that Game Avatar names would not be acceptable. Then on March 30th 2015, I received a brief FB posting from Facebook Community Operations (see image to the right - click to enlarge). It told me FB seemed to have made a mistake in suspending my account. They restored my account and the closed my case. AND they were so very sorry. Initially I was confused and a bit nervous & excited since I received this posting while on my replacement FB Scott account. I thought maybe somehow they were planning to delete Scott for some reason, but no, I was on it so that couldn't be the reason. Then I went to see if they might have restored my Toysoldier Thor account they deleted last year, but it was still completely gone. So I just shrugged it off assuming FB just made a mistake posting this to me. What I didn't realize until hours later when an SL friend pointed it out to me, FB actually transformed my active Scott FB account name to my original SecondLife avatar name "Toysoldier Thor" ! Almost a year after FB deleted my Toy account, FB fully restored my FB SL Toy name. They did NOT resurrect my old Toy account they deleted last year - thankfully. What they did was change my active SCOTT named account to the name Toysoldier Thor. As such I did not lose ANY of my almost 500 friends that I rebuilt under the SCOTT name over the past year. Therefore, all my current friend list in FB instantly now saw me at Toy again! HOW WAS THIS POSSIBLE - AGAINST FB's CLEAR REAL NAMES ONLY POLICY? Many of you are asking .... HOW THE HECK DID TOY DO THIS ?? Considering FB's outdated TOS policy has been very clear and made even more clear that game character names like SL names are not allowed. And considering FB has a very well known strict history of actively policing this dreaded policy and wiping out several 1000's of SL named accounts over the years. Even though - thanks to the intense pressure against FB last year by communities like the Drag Queens / LGBT headed up by Sister Roma - FB looked like they were beginning to softening their stance, to date their actions have not matched their stated promises. In fact recently it appears they have been more entrenched on the old policy. I want to first tell everyone that I personally DO NOT EXACTLY KNOW the actual reasons why FB decided to restore my SL Avatar name on my FB account. But based on my understanding of FB's policy and all the FB statements that have appeared because of recent intense pressure spearheaded by Sister Roma and the Drag Queen community to change this outdated policy, I have a good idea of why FB might have restored my Toy FB name. I believe the primary reason was that I extensively proved to FB in my appeal that my name TOYSOLDIER THOR is not just a SL Avatar / game character name. 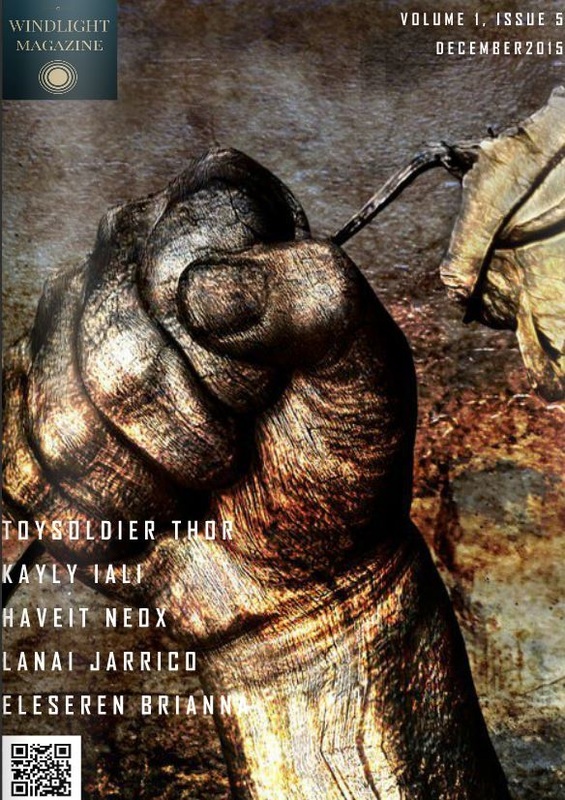 Luckily for me, over the past several years I have used my "Toysoldier Thor" avatar name as my common online identity and even my BRAND NAME throughout my growing existence in the virtual world and respective online communities. Over the past 7 years whenever I joined a new online community / website / service, I created using Toysoldier Thor. As such, my appeal to FB that Sister Roma took forward to them included an extensive list of "Toysoldier" identities as evidence that Toysoldier is a very strong wide-reaching common identity known by a very large sphere of communities that I participate and am known by. In other words a very significant portion of those that know me, know me only as my identity of Toysoldier Thor - not my legal real life name. I logged into fourteen of these online services / sites that uses my Toy account name and I did a screen shot showing my account name on that site / service. I attached all of these screen shots to my appeal. To the right you can see all the screen shots I sent to FB as evidence of Toysoldier Thor's existence FAR beyond the scope of the SL grid. To the extent that I saw my "Toysoldier Thor" identity as a brand and also as a layer of protection against Linden Lab's 2013 TOS policy change where they allowed themselves full unrestricted access to our SL content, I decided in 2013 to "unregistered trademark" (aka the TM symbol) my "ToysoldierThor.com" name. My personal research showed I was the first and only known person to use this name. So from my research on TMing, I decided for me it was an acceptable option to pursue. The fact that my Toysoldier Thor name was TM'ed might have also been a factor in FB's decision to restore my name. PLEASE NOTE: I am not a legal or trademark expert. As such I am not advising any of you should consider trademarking your names like I did. It is what I did for me based on my research. If you are interested in this idea, do your own research and consider seeking professional advise before deciding if this is a good idea for you! Finally, my appeal was ONLY possible because of the assistance of Sister Roma. She was able to forward my appeal through a more direct FB communication channel whereby my appeal would actually be read and considered. FB's public community support teams and processes are 100% NOT DESIGNED TO HANDLE ANY APPEAL OF A VIOLATION OF A FB TOS POLICY! I can assure you of that based on my two appeals through this process. This staff has been told to follow the policy rules as stated and they do not even read any appeal content in the case. I am not sure where Sister Roma forwarded my appeal within FB but it was clear that my appeal was treated with respect / attention and the present facts were consider by FB staff that could actually make FB policy interpretation decisions. 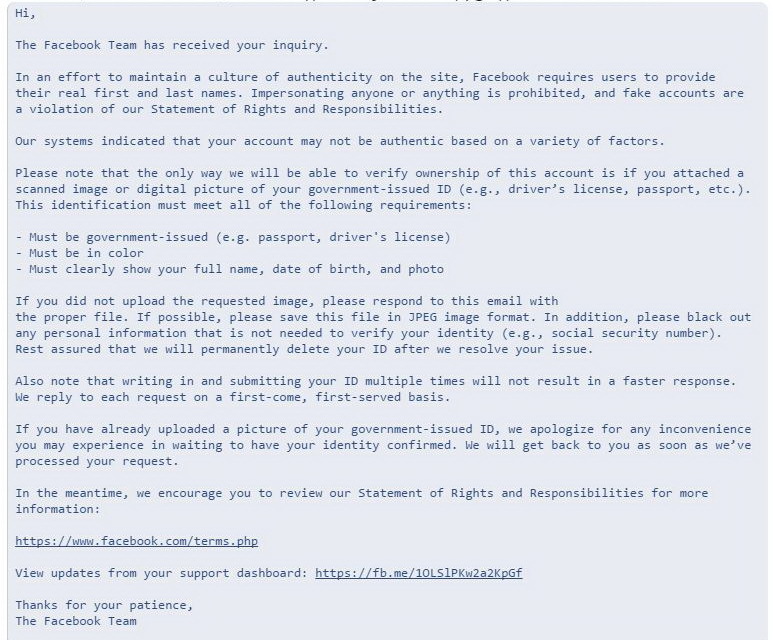 This is not something that the general front-line FB support staff can do nor even escalate up when received. So THANK YOU SISTER ROMA! SHOULD YOU APPEAL FB TO GET YOUR SECONDLIFE NAME BACK? 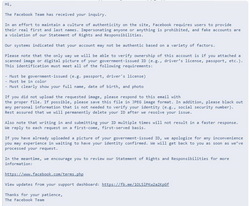 As you can see, it is highly unlikely that FB restored my SL named FB account and went against their very rigid "real names only" policy simply because the right person in FB was asked. The conditions / situation was right in my case for FB to justify that my SL name could be returned as my main FB account name (without the use of a sub page or using a nickname) because I provided enough overwhelming evidence that my "Toysoldier Thor" identity was not violation of the spirit of their current policy. So now many of you are asking if it is possible that you could strike up an appeal and follow the same steps as I did to get your SL Avatar name back as your FB account name. Likely after reading what you have so far, 90% of you have already decided that sadly for you an appeal would likely be waste of effort and a "No Joy" result. Why? Because I suspect that most of you that were considering it only use your SL Avatar name for SL and maybe one or two other sites / grids / services. Do you like having a FB account that uses your Real Life name and do not have any issues using your real life identity for your SL community of friends as well? If so, no need to appeal for your SL avatar name in FB. If you do happen to maintain two FB accounts (one for your RL world of friends and another used only for SL), do you want to potentially risk losing one or the other if FB discovers it and decides to delete one of your two? If that risk is too great then think carefully about filing an appeal since you would provide enough details that they might discover your other account. Important one.... How many places is your SL avatar name used for other website or online community accounts? i.e. blog sites you run, twitter, google+, flickr, skype, fb, instagram, art sites, music sites, etc. etc. etc.? The less instance of your name being used outside the SL grid, the weaker your case will be to convince FB to restore your name. If its ONLY used in SL, then I would say filing an appeal with FB would be a waste of time since FB staff don't have any argument to show that in your situation your SL name is not a violation of a FB policy. Is your SL avatar name used outside SL as a well recognized / strongly promoted RL stage name, pen name, author, celebrity name, etc.? If the world outside SL knows your SL avatar name as your identity in these communities then you have a strong case to appeal. You must have a FB account that was reported, suspended, deleted for them to review as an appeal. IF YOU DECIDE TO APPEAL FB TO RESTORE YOUR SL NAME - WHAT NEXT? So, after reading all this you have decided you have a strong case to appeal FB to restore your SL name as your primary FB account name. What should you do next? Well I can tell you that Sister Roma has told me that she would be willing to forward to FB any appeals sent to her from any of you that wish to appeal FB. What a generous offer by her! But, before you get to this step, there is some homework you must get done and data you must gather and write down that you will send to her. Start researching and collecting all evidence that supports your cause that you - the real life account owning human - are very well known and recognized by your SL Avatar name in communities outside your SL virtual world. If your avatar name is register trademarked or exists in ANY legal form; If you are an Artist and exhibit your art / sell your art with your avatar name as the signature (like me) to the greater community; If you are a performing artist and your SL name is also your stage name in RL or other online music communities; if you are a poet / book writer and you sign your works by your SL name; if you are an active online blogger for a target audience much larger than SL; etc. etc. etc. Look hard for ALL EVIDENCE LIKE THIS. Capture all the evidence you found in step one into an electronic format... i.e. screen captures, photos of billboards, signed books, signatures on art, etc. What ever the evidence, get an image of it that can been attached. You will want to attach all this evidence to the FB APPEAL EMAIL you will create and send to Sister Roma. What I did was place all these images on a web page so I could simply include the URL link to all this evidence in the email. Kept my email smaller. Explain who you are as it relates to your SL name and provide all the collected evidence that could help FB evaluate why your account may have been inaccurately suspended or deleted. Explain why you believe your SL name would not violate the spirit of the current FB policy on real names only. Remember that your legal name may not be your "real" name. Your real name is the one you've chosen and live with each day. Your real name is the one that a very large portion of your sphere of communities knows you best as. In my case I proved to FB that even though I have a real life name used in my real life community by friends and family, I have an even large sphere of contacts world-wide that know me only as TOYSOLDIER THOR. Explain this in your email. Provide your authentic name (the name you go by in your real life and that you have used on Facebook) and as it should appear on your FB profile. What you write in your email to Sister Roma is what she would consider forwarding over to the right people at FB for consideration. Sister Roma will likely respond to you that she received it and her thoughts and what she will do next. Then, at least in my case, expect to wait up to 6 - 8 weeks for a response from FB directly. I will also conclude this blog with a CYA statement. Proceed with your appeal at your own risk. This blog just provides my experience, opinions, and some guidelines to consider IF you want to appeal FB. But ultimately it is 100% your decision to proceed with approaching FB and what ever outcomes happen as a result. I am NO EXPERT and have NO FORMAL INSIGHTS with anyone at FB or elsewhere. I have just blogged my personal experience and thoughts and opinions. If you proceed - Good Luck to you! This week Inara Pey - one of the most well respected bloggers for SecondLife® - she visited Toy's art gallery and wrote an amazing post about his artworks at his art gallery on her popular "Living in a Modemworld" blog! Toy was completely surprise by the blog. He was informed via IM by some stranger inworld who read it and like my art and the article by Inara Pey. Inara totally humble Toy with her comments. She also pointed out a very important highlight of all of Toy's artworks - that he writes and includes a personal Artist's Comment notecard for each of his artworks. CLICK THE IMAGE TO SEE Inara Pey's Blog Posting! SL Enquirer story : "Behind the Scenes with Toysoldier Thor"
Earlier this month, SL Enquirer's Reporter Debby Sharma visited Toysoldier Thor at his art gallery for an in-depth interview. Toy reveals a lot of "behind the scenes" details regarding his art passion, current projects, and even a glimpse into his future art plans. Toy thanks Ms. Sharma for her time and interest in reporting on what he has been up to with is art. The Best of SL (BOSL) writes about Toy's Bronze Project! 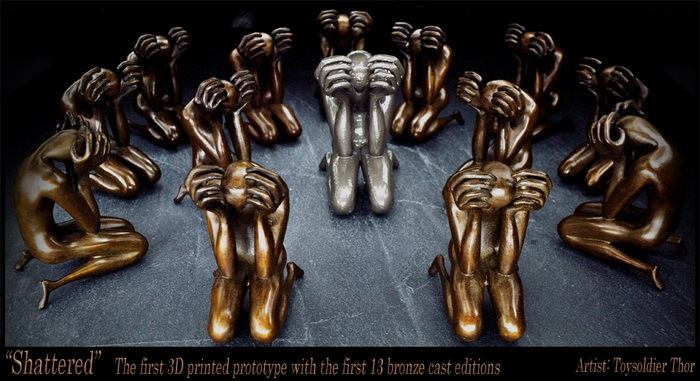 In January 2015 Toy kicked off his exciting project to transform his "Shattered" SecondLife® mesh sculpture into a limited edition real life bronze casting for him and those that signed up to join him. The well respected magazine The Best Of SL (BOSL) wrote an excellent article about Toy's project in the February 2015 issue (pg 36-45) just released this week. The BOSL article captures Toy's journey to what is possibly an SL Art First. 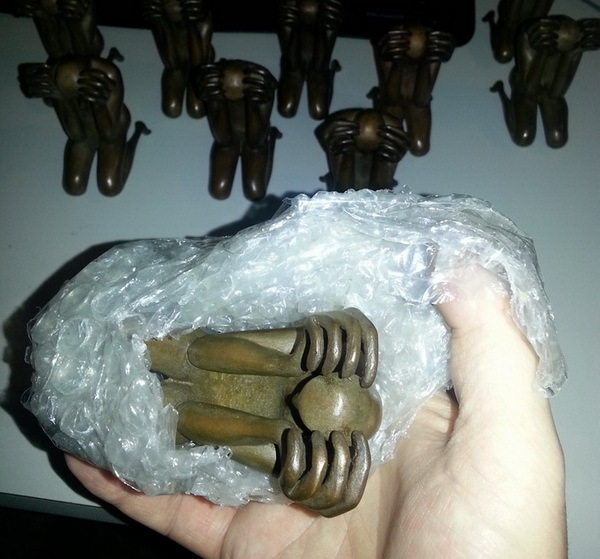 It mentions how the first person to sign-on and order one of Toy's limited edition bronze casts was no other than President & CEO of Linden Lab Inc. Ebbe Altberg and Toy's feeling about Ebbe joining in on this exciting project. Finally, BOSL includes several great photos including those captured by BOSL Photographer Addison Summerwind. 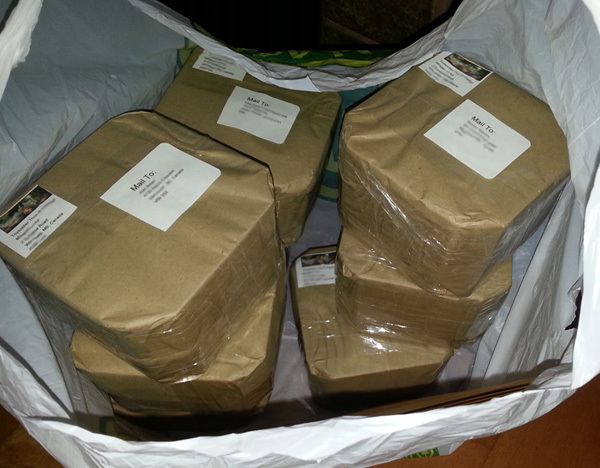 To the right are a couple clips of Toy reading his inworld issue of the BOSL article. 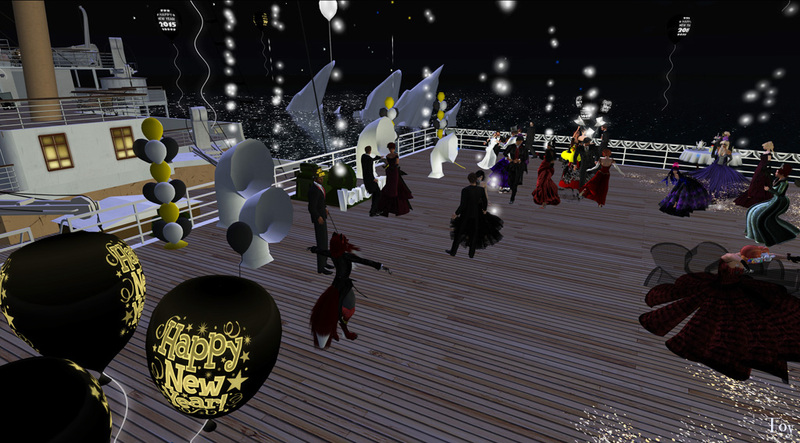 Secondlife® New Years Party on a Sinking Titanic! Electric Monocle in SecondLife® (SL) venue delivered a memorable themed party event to ring in 2015 by partying on the upper stern deck of the TITANIC. And the ship sank as we rang in the new year ! SL's owner of the cool event-themed electro-swing styled Electric Monocle venue Lindy Hopper (aka Subversive Vavoom on FB) has really been making a name for herself and her amazingly planned themed weekly swing parties. They are always well thought out, the venue settings always built with great detail to match the theme, and even requests for guest to dress up to match the theme adds to the ambiance of the event. Attending an Electric Monocle event is always an interesting and fun treat for the eyes and ears... not to mention the interaction among all those that attend! A real unique party time! But Electric Monocle really blew the bulkhead doors wide open when they hosted two sessions (7p-9p & 11p-1a slt) of their New Years Eve party on an actual sinking sim-scaled replica of the Titanic! I attended the later session - boarding the ship just after 11pm slt. The party was already in full swing (pardon the pun) on the upper stern deck of the most amazing SL build of the Titanic I have seen. Lindy was DJing her well known electric swing genre of music. The deck was decorated with new years eve festive props and the souls on board at the party were in themed costume and dancing under the fireworks being shot over the ship on this cold Atlantic moon lit night. This Titanic ship build was so large it stretched from bow to stern diagonally across an entire sim that was set as a dark Atlantic ocean night with icebergs floating in the distance. Whomever was the builder of this replica build put a lot of time and effort into capturing all the details. Details that included both the ship as it was seen in the famous James Cameron movie "Titanic" as well as its famous movie scenes we all know and love. Then, if the event was not already fun enough, as the clock approached midnight, Lindy pulled the cork on this big boat and it actually began to slowly sink ! You could see the water rising along the hull of the ship in the cold Atlantic night air with the icebergs in the distance lit up by the full moon. The water flooded the lower decks in short order. Then, our upper deck deck dance floor flooded. We all kept dancing as it got deeper and deeper. Some of us pulled out rubber duck life rings to protect us but to no avail... the ship eventually took us all down! Here are a few photos of the Titanic sinking while the party played on! Eventually - unlike the real Titanic - the ship was re-floated and we all requested that Lindy sink the ship a few more times! Last night I attended quite a few new years eve parties and venues and it was fun fun fun, but I will have to say that Lindy and the Electric Monocle team were certainly the grand finale and highlight of my new year night in SL.. It was honestly one of the most memorable new years eve parties I have ever attended in my almost 7 years in SL. For those of you who love electric swing and / or love amazing themed parties... you need to add yourself to the Electric Monocle group and attend their up-coming parties! Incredible event Lindy and Electric Monicle - thanks for a good time! PS... I lost my luggage somewhere in the ocean!